You close your eyes, and you find yourself suspended in cool water, mask on, eye to eye with a fish. This is the sweet spot in a river snorkelling adventure. But how do you get there? All you need is appropiate thermal protection for the water temperature, a mask, a pair of fins, a river, and a sense of adventure. It helps to know when to go, and to learn about the fish who live in that river system. Then you dive in. I set aside a few weeks each year to return to my home river when the salmon do. In autumn, I spend my days between the banks of the Campbell River, the artery my home town is build around. Over the years I began to bring a camera, which has grown in size, and this past autumn I returned with the aim to share the salmon’s journey through photographs. The ultimate purpose of the images is to inspire action for us all to care for our home waters. In my experience, nothing inspires caring about rivers, lakes, estuaries, and oceans like seeing eye to eye with the creatures who call these places home. The fish pass by overhead like birds blacking out the sky; a great migration of the finned. But whether feathers or scales flying overhead, the abundance of life driven by such purpose is a truly moving sight. After completing the great migration from ocean to home river, female pink salmon lay eggs in a nest dug in the gravel of the riverbed. She will guard her nest of eggs until she dies. 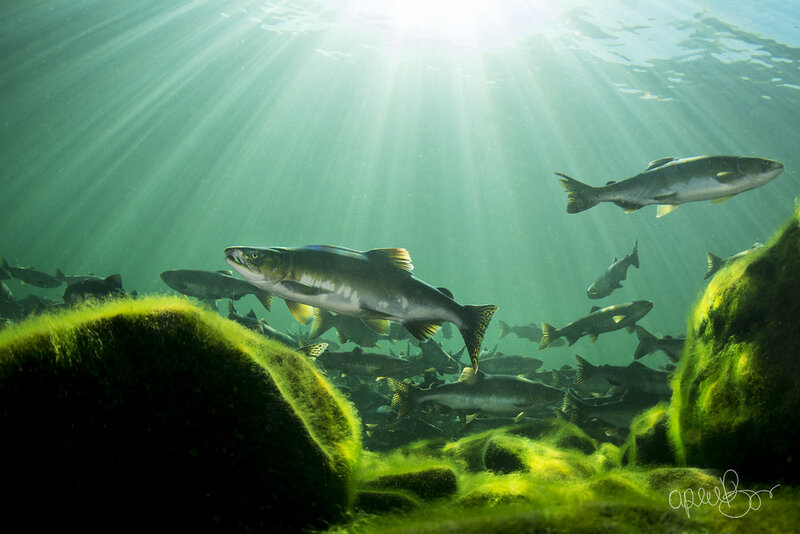 Once the eggs hatch, the next generation of salmon swim to the ocean where they grow up in the saltwater. The fish live out their lives for about 18 months before beginning the journey back to their home river to spawn and die. Pink salmon have an average life cycle of 2 years. After death, the salmon’s decomposing bodies continue to give life to the river, surrounding forest, bears, birds, wolves, other wildlife, and us humans too. It’s all connected. I remember the moment it occurred to me, a few years back, when I first started visiting the fish. I closely resemble a seal when I don my black wetsuit and slip below the surface. Funny, I felt like a fish when I would propel myself underwater with my faux fins and breath held. I wondered how to convey the message to the salmon who scattered at the sight of me. Fish are friends, not food! But I catch fish to eat, so maybe I am more seal than scales. Or perhaps I should simply resign myself to being a human who teeters on the edge of both land and sea, not quite fitting fully into either element. But right then I was only interested in taking their photo, not their flesh. Something about salmon are so captivating to me, and I wonder if it has to do with the way they helped build my body as I grew up, or how they continue to warm my belly and sustain me through the long west coast winters. The relationship between predator and prey seems a complex and intimate dance. I find myself needing to be a predator of salmon, but simultaneously wanting to be a part of their incredible world for a moment or two. You never know what lessons the river will teach you. Photographing a strong run of pink salmon, I wasn’t expecting to look over my shoulder and find myself face-to-face with a brilliant red sockeye salmon. But there he was, a lone red amongst thousands of pink. He weaved aimlessly through the bustling school, standing out quite remarkably. Soon after, I watched him grow weak and drift like a fallen leaf to the river bottom. The algae-coated rocks became his final resting place as his body slowly began to lose its brilliant red, his emerald head faded to grey, and his golden eyes lost their life. Crayfish crawled from the dark spaces between the rocks to tug on his lifeless fins. I learned quickly that his body would not be wasted. Each day I came back and watched his remains slowly become a part of multiple other creatures. It was incredible seeing the sockeye decompose over many weeks. This was a season of learning about life and death at the salmon river. Autumn rains greet and join the river as we slip into damp wetsuits and join the salmon below. It’s tough to untangle these colours, the underwater blues and topside golds, from the fall season. Freshly rusted leaves tumble from trees above; sinking into the periphery as we watch the fish stream by. It’s like the seasons are listening to the fish; waiting for a cue to shift. As if in celebration of this momentous return of life, the trees turn gold to pay their respects to the spawn. The salmon make their way up river for the first and final time, passing beneath over-hanging branches stretched out like arms cheering them on. Soon these very salmon below will feed these very trees above. When the seasons eventually shift to spring, the bodies of these fish will help replace these fallen leaves. There’s a little creek nearby. It bears a few chum salmon in the fall, but it’s the heart of winter now. The salmon are out at sea, growing. 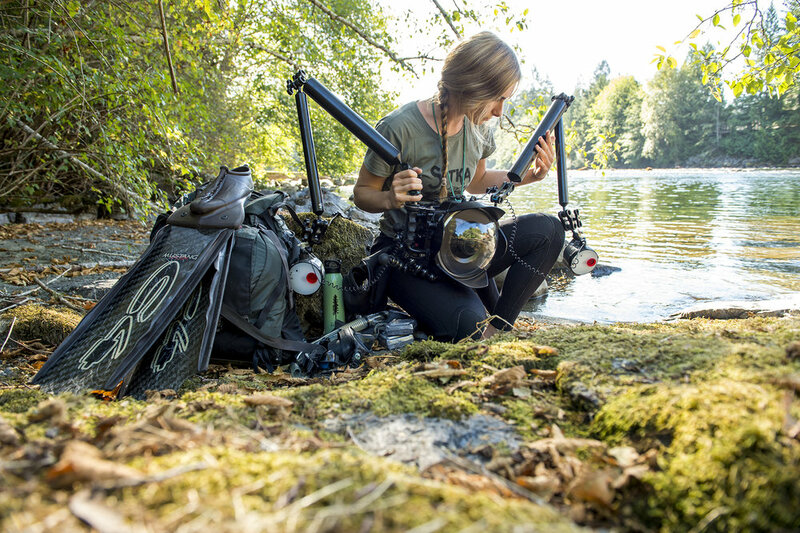 They say ‘where there is water, there is life.’ So we head out in search of life at the creek, drysuits donned and underwater cameras in hand. We trekked upstream and found a pool just deep enough to submerge our faces in. We quickly spotted juvenile cutthroat trout. Though well camouflaged, these young fish were brilliantly coloured. With eyes like gems, they gathered below tiny waterfalls. We watched and photographed the tiny trout with fascination. I still marvel at the adventure that can be had in six inches of water. These two juvenile cutthroat trout live in a small creek nestled within a large temperate rainforest. A forest where moss blankets everything; even cushions the feet of wolves and bears. 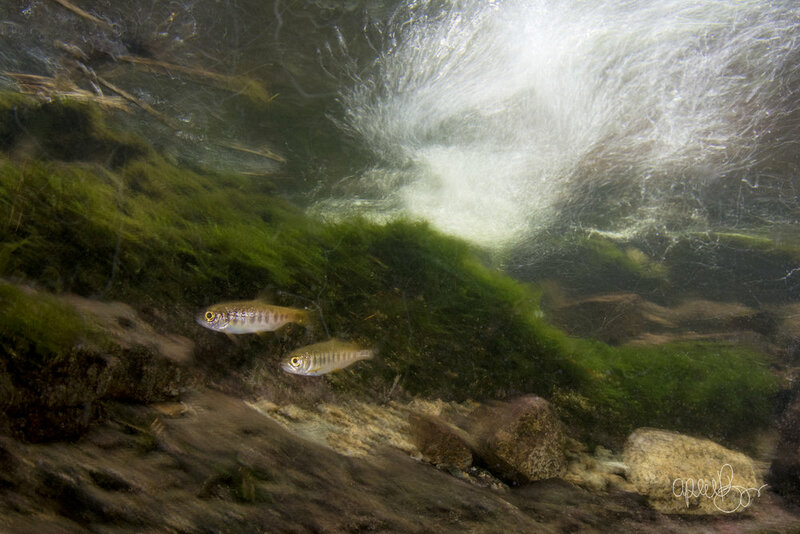 These young trout in the creek in the forest are contained on an island within an archipelago of rainforest islands off the coast of British Columbia. There are layers upon layers of life unfolding in places within places. Opening our eyes to that life, and the connection between it all, reignites a dying sense of wonder.